All transactions are safe and secure with a reliable history in online purchasing behind each of our associates. Buy The Texas Chainsaw Massacre Leatherface t-shirt to own Texas Chainsaw Massacre clothing and merchandise. Show your support for The Texas Chainsaw Massacre with this Leatherface blood splatter design. The fronts of these Texas Chainsaw Massacre Leatherface t-shirts feature the butcher holding his chainsaw in the form of a black and white silhouette on the white apparel background. The tee is perfect for having a gore-themed dinner party and watching Leatherface movies on your big screen TV. Wear this with your Texas Chainsaw Massacre mask for a complete Leatherface costume. 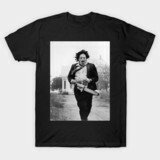 In addition to The Texas Chainsaw Massacre Leatherface tee above, browse the Texas Chainsaw Massacre Clothing Gallery for more apparel like men's and women's clothes, kids shirts or hoodies.